As the holiday season approaches, many people feel their stress levels rise. It is a busy time of year and we often bite off more than we can chew. I know that many of us wish we could have more time to relax and truly enjoy our holiday season. 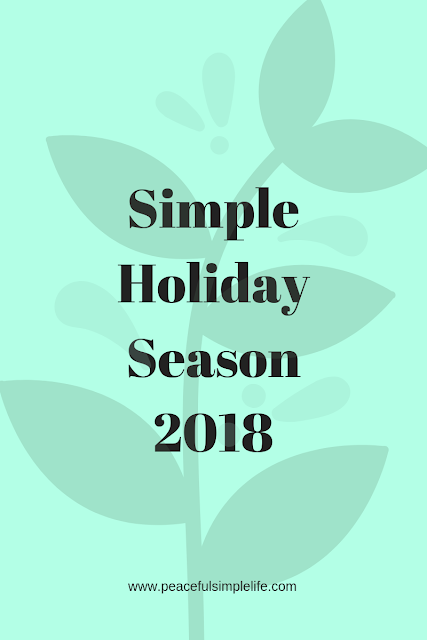 I hope that this 'Simple Holiday Season' series will inspire you to enjoy the little things in your holiday season. In my 'Frugal Friday' posts I have encouraged people to identify what is most important during the holiday season to them and their family. I then asked them to focus their finances on what they thought was most important to them this holiday season. I ask you to do the same thing with your time. Cut out activities that don't align with your focus. Say no when you are stretched too thin. We can't make more time, but we can use our time wisely. There will be obligations that are unavoidable, but not everything can be a priority this holiday season. Sit down with your calendar this week and sort out all of your obligations, engagements and things you want to achieve. Schedule in time to relax and practice self care (sleep, exercise, etc.). Treat it with the same respect that you would give any other calendar obligation. Plan your family fun. Give serious thought to the items on your calendar and decide if they truly are necessary. You are in control of your schedule and you can choose to say no to anything that detracts from your well-being.